Earth, A great place to visit! Where did the planet Earth come from? That is a great question many people have asked. The only answer that I know of is this: "In the beginning God created the heavens and the earth. Now the earth was formless and empty, darkness was over the surface of the deep, and the Spirit of God was hovering over the waters." This is what our planet Earth looks like. When Earth is finally visible this is what it'll look like. 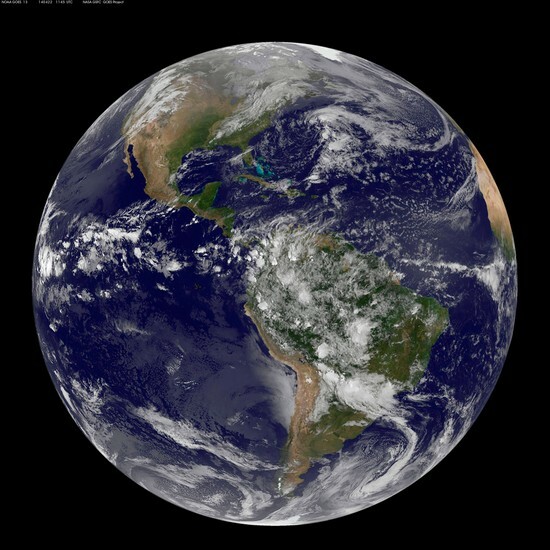 The circumference of Earth at the equator is about 24,902 miles (40,075 km), but from pole-to-pole — the meridional circumference — Earth is only 24,860 miles (40,008 km) around. This shape, caused by the flattening at the poles, is called an oblate spheroid. Earth has only one moon and there are 24 hours in a day. We have seasons because the earth is tilted (wonky) as it makes its yearly journey around the sun. The Earth's axis is tilted at an angle of 23.5 degrees. This means that the Earth is always "pointing" to one side as it goes around the Sun. It takes Earth 24 hours, or 1 day, to make a complete rotation on its axis. It takes Earth 365 days, or 1 year, to make a complete revolution around the sun. Where does Earths energy come from? The Sun radiates huge amounts of energy. Only a small portion of that energy hits the Earth, but it is enough to light our days, heat our air and land, and create weather systems over the oceans. Most of the energy you will learn about comes from the Sun. Why is Earth and all the objects in our solar system our spherical? It all comes down to gravity. All the atoms in an object pull towards a common center of gravity, and they’re resisted outwards by whatever force is holding them apart. The final result could be a sphere! A unit of astronomical distance equivalent to the distance that light travels in one year, which is 9.4607 × 1012 km (nearly 6 trillion miles). Which force is responsible for the formation of the solar system? Why should you visit Earth? Earth is one of the best planets to visit!! We have everything, LITERALLY! We have seasons, oceans, land, animals, days and nights. We have everything another awesome fact about Earth, is that we have oxygen!! So you can take off your space suit and enjoy life how it is!! I recommend bringing various types of clothing such as sunglasses, shorts, bathing suits, jackets, gloves, shoes, googles, hats, gloves, long sleeve shirts/ short sleeve, flip flops. It depends on which part of Earth your visiting of course! I also typed up the questions on Google and Google gave me most of answers.